This is the dead centre of Paris, we’re gone 65 feet underground to stare death in the face, an underground labyrinth of death, these are the Catacombs of Paris. A bone chilling walk of two kilometres through claustrophobic caves, quarries and tunnels amongst this empire of death. 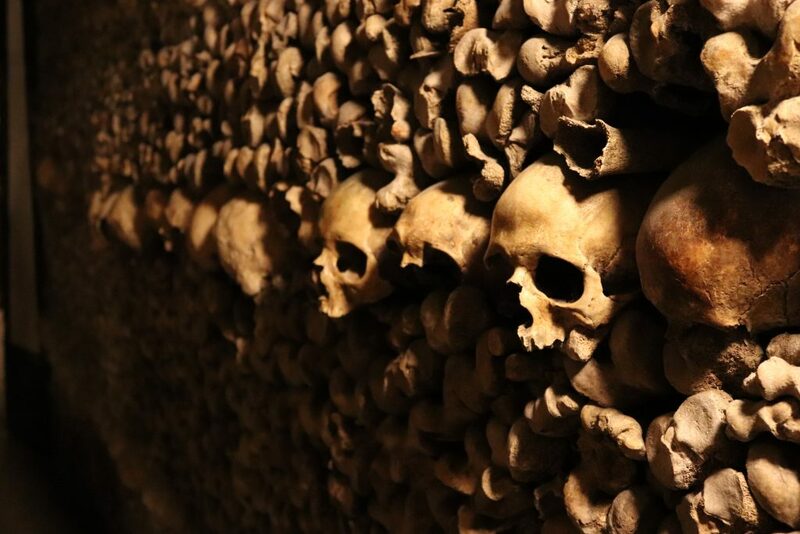 Not sure if this diversion on our Paris trip is a ‘dark tourism’ site, we’ve seen Auschwitz and we’ve been to a nuclear bunker, but it certainly appears that the creepy cold catacombs of Paris have an attraction. The queues are horrendous, we booked pre-timed tickets for the early evening (17:00), the shuffling horde of the unbooked queue was going to have a long wait and a lot of very disappointed people who were not going to get in before it closed. Only 200 people are allowed in at any time. Given an audio guide, we then descend a steep spiral staircase to delve into the depths and walk among the dead. The journey is then, literally and figuratively, a one way journey. 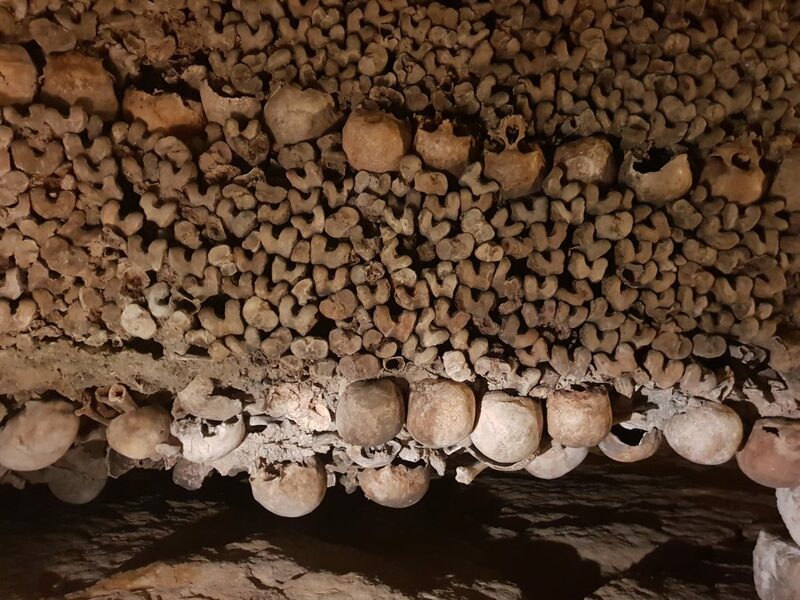 It feels like quite a trek following this somberly lit underground route through the Paris catacombs, the biggest ossuary you’ll ever see, the catacombs are 200 miles of tunnels built to keep Paris from collapsing. It’s a stunning amount of bones, and everywhere I look, I see dead people. Considering the amount of miles we’ve walked during our Paris city break, I’m lucky my wife hasn’t killed me and added me. Piled from floor to ceiling are stacks of skulls and femurs in skeletal decorative displays. While I have a certain fascination with skeletons, a selfie with a skeleton doesn’t feel quite right. Then it hits you, these walls of bones are of 6 million former residents, each skull was a person, and every person has a story. A story we’ll never know, but the same end result for everyone, everyone dies. Someone’s father, someone’s mother, brother, sister, all piled up. It gets you thinking, what will be remembered after me after I die. I become a pile of bones at best. Eventually, there will come a point when no one will remember you. All that’s left is bare bones.